As special agent Maximilian (or Maxine) "Max" Remington, you are the premier anti-terror agent in the world. CIA have received tips and clues about some suspicious activities of some known bad guys... Gather enough evidence through house search, wiretaps, etc. Decode any messages you discover to unravel additional clues. Each operation will be handled by multiple people. Figure out the crime BEFORE it happens and get enough evidence to find the true mastermind behind the whole thing... Then chase down and arrest the suspects via car chases or go into the house arrest the suspect yourself. Can you arrest all the masterminds? 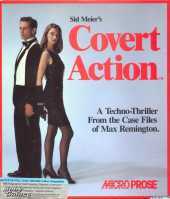 Covert Action is best described as a secret agent simulator, with a heavy dose of puzzle and some top-down shooter action. You'll follow the hints all over the world, surveil suspect safehouses, apply wiretaps (which is a puzzle sequence), even go inside and check each and every drawer without arousing suspicion (by keeping VERY quiet). If you're discovered, you'll need to AVOID car chases or you'll end up shooting it out with the bad guys. You can also "tail" a suspect (with multiple cars) and see if you can find another safehouse or more headquarters to search for clues. You have silenced pistol (or Uzi) and three different types of grenades, plus other high-tech toys. As you get closer to the mastermind, the plot gets more intricate, timeline gets shorter, code breaking is tougher, and enemy harder to take out.